A fruiting body of Heterobasidion irregulare at the base of a pine tree. 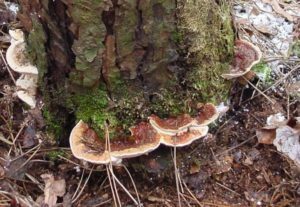 Wisconsin DNR is seeking public comments on a proposed revision to preventative treatment guidelines for Heterobasidion root disease (HRD). Stand-level HRD treatment guidelines were originally released in 2013. A DNR technical team and stakeholder advisory committee proposed a revised version using recent research findings, operational experience, and economic considerations. The draft document and information about the public comment process can be found at https://dnr.wi.gov/news/input/Guidance.html#open through Tuesday, October 16, 2018. All comments must be submitted by that date.